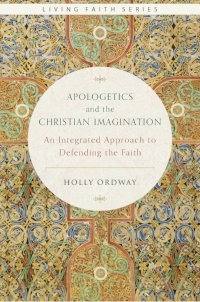 Apologetics and the Christian Imagination: An Integrated Approach to Defending the Faith, written by Dr. Holly Ordway, was published in 2017 by Emmaus Road Publishing. I was given a Kindle review copy of this book in exchange for the writing of this post and providing my honest opinion. Also, in the interest of full disclosure, Dr. Ordway was my faculty advisor while I was pursuing my MA in Apologetics at Houston Baptist University. This book asks a question, “What is the role of the imagination in Christian apologetics?” Of course, unpacking this question requires understanding how these terms are being used. Apologetics is defined in the rather traditional way of a defense of the Christian faith, but Dr. Ordway proposes that rationality in and of itself is not enough to provide a holistic defense of Christianity. This highlights one of the main strengths of this book right from the beginning. Apologetics can sometimes become simply the realm of memorizing lists of evidences for the resurrection or trying to remember the exact construction of a logical proof defending the existence of a creator. These reasonable approaches are vitally important, but as Dr. Ordway points out, the imagination needs to come into consideration as well. Before proceeding, it is important to realize how this book defines the word imagination. It is used in the more traditional, medieval sense as opposed to the way it is used in our modern vernacular. Dr. Ordway is very careful to point this out in her text itself and clarify the difference, but just from the title of the book, it might be possible for some readers to misunderstand what this book is actually going to be about. Dr. Ordway cites CS Lewis who wrote that, “Reason is the natural organ of truth; but imagination is the organ of meaning. Imagination, producing new metaphors or revivifying old, is not the cause of truth, but its condition” (Kindle Locations 338-339). Equipped with this understanding of imagination in the appropriate contextual sense, the reader is then brought through journey that seeks to show apologists how to bring meaning to the world through our apologetic interactions. A list of facts in and of itself might be reasonable, but until the audience understands why those facts are important, they are not really going to care very much about remembering those pieces of information or applying them to their lives. Dr. Ordway writes, “If someone can find the idea of the supernatural to be meaningful— an idea that can be grasped, that is worth grasping— then, and only then, is the question ‘Is it true?’ significant” (Kindle Locations 566-568). Using this concept that reason and the imagination must go hand-in-hand, Dr. Ordway proceeds to take on some traditional hot topics in Christian apologetics and shows how the imagination can help to address these questions. For example, in the chapter on pain and doubt, the presentation of stories and actual personal accounts is brought to the forefront. “We need to tell stories that show our need for rescue and redemption, and that there is no place so low, no state of weakness too profound, no state of desperation so deep that God cannot find us and rescue us” (Kindle Locations 1938-1940). The temptation for someone like me is to dive right into a logical proof as to why the existence of God and the existence of evil are not logically incompatible in the style of Alvin Plantinga. Dr. Ordway suggests a different approach. It is important to identify with our audience, and it is important to meet people where they are at in times of suffering. Stories communicate that meaning in a very special way. “When someone brings up the problem of evil, or the problem of suffering, our first priority should be to recognize the reality of the problem and mourn with those who mourn. Only in the context of compassion will our arguments have real meaning” (Kindle Locations 1942-1945). Overall, this is an excellent addition to your apologetics library. I am not a Roman Catholic, so I would point out that I was not able to connect as deeply to some aspects of this book as other readers might be able to, but this is obviously not a book that is limited to a Catholic audience. Any “mere Christian” will be able to benefit greatly from this book, but I do think that a Catholic audience will understand some illustrations more deeply than I did. Dr. Ordway is a gifted communicator who, through this work, pointed out to me how important it is to remember the distinctively human aspects of our apologetic interactions. It can be tempting to memorize apologetic formulas and to try have the perfect argument for every situation, but that is not the way that people actually interact. People desire meaning, and our apologetic approach needs to embrace that.